Are universities even trying to create social mobility? Posted 1st December 2017 & filed under Blog. A key argument for high tuition fees and expanding university places has been that this will increase both social mobility and mixing between social classes. These objectives are linked: social mobility is advanced partly through the process of students mixing across social divides. Ethnic segregation at universities has been widely signalled in various reports, but segregation by social class is not so often discussed – even though the consequences are profound. Usually such complaints focus on Oxford and Cambridge, which – by their stringent admissions policy alone – can be described “elitist”. But the problem is broader than that, as indicated in a report published by the Higher Education Policy Institute (HEPI) by Professor Tim Blackman, the Vice-Chancellor of Middlesex University, in July 2017, entitled “The Comprehensive University”. His research lends credence to the impression that many outside observers (such as myself) might have: that universities are actively segregating people by social class and that policy-makers are creating obstacles to stop working-class graduates from joining the middle class. But even within universities, courses are not equally open to all. Some courses are really only open to middle-class teenagers – classics (taught primarily, although not exclusively, in private schools) is an extreme example. But this applies to other subjects too: maths is dominated by middle-class students because to study it you really need to have studied both maths and further maths at school and most comprehensive schools can’t offer that option at A-level. Consequently you get the clumping together of middle-class students in these and many other subjects so that the middle classes are drawn together. This even sometimes extends to living accommodation in halls where students studying similar subjects are housed together. But encouraging those with the same background to live together is also promoted through other university mechanisms: as soon as a uni place is confirmed the student is asked to make a choice of which hall they will live in, each with different costs and features – you pay more for better accommodation. Naturally the middle classes and wealthier students opt for the better rooms and are thus bunched together. So as soon as students start their courses, they are usually already living with people from similar backgrounds. The process of social segregation continues in the clubs and societies and university sports. Once students leave university the segregation continues. About half of graduates go into non-graduate jobs and even after five years a third of them are still in non-graduate jobs. But the combination of high housing costs and repayment of student loans makes it very hard for graduates from lower socio-economic backgrounds without access to the “bank of mum and dad” to help with living costs, let alone to accumulate any capital, which is seen as a hallmark of middleclassdom. Let’s take a typical working-class graduate moving to London and starting on £20,000 a year before tax. Using the government’s tax estimator, one can see that their income tax will be £1,700 a year and National Insurance (NI) is £1,400, leaving them £16,900 a year. A typical room in London will cost at least £600 per month if they want to live centrally and, even with a long commute, rental costs do not drop much. So this new graduate will be paying about half of their income on rent, leaving only £163 each week to live on, which has to cover transport costs, food and everything else. Clearly this leaves precious little for saving or luxuries. The obvious way out and up is to get a pay rise. When this happens there is a large extra drag in income once the graduate is earning £25,000 because their marginal “tax” rate goes up to 41% (20% income tax, 12% NI and 9% student loan repayments). Contrast this with a graduate with middle-class parents who has no student debt and may well get significant help with housing costs: they will be able to build capital significantly quicker and also be able to save for a flat or house. 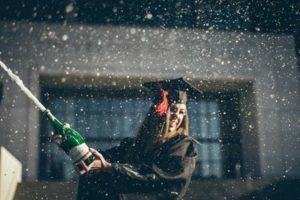 If we really cared about social mobility and social mixing we would pay more attention to statistics and research collected by organisations such as the Higher Education Statistics Authority (HESA) and the Sutton Trust – and act on them. They say “that which is measured, improves” and that has, for example, been the key to getting more women into parliament and more ethnic diversity in workplaces.